Dont Let Anger Ruin Your Life! 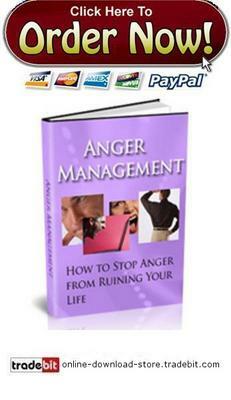 Discover How to Gain Control of Your Anger Before It Gains Control of You! If you currently have an anger problem that is causing you difficulties at work, in your personal relationships, and/or in the overall quality of your life then this is definitely the most important letter you will read today! Its true. If anger has been disrupting your life at work, at play or it has caused you to hurt (emotionally or physically) those around you, then I urge you to read on! Stop Anger in Its Tracks! Anger has a sneaky way of making itself known in the most uncommon of situations, which most often the person getting angry doesnt have any control over. Sometimes people dont even know that they are angry until something happens to trigger the sudden change in mood. If this has happened to you, you may feel that there is no way to fix your underlying problem because you dont know where it stems from. Thats right, you no longer have to feel like you are at the mercy of this powerful emotion. You can control it. All you need to do is to read the expert tips, tricks, techniques and secrets contained in Anger Management. * 5 common root causes of anger and how to stop letting these causes affect how you feel! * How to learn to appreciate what you do have control over, rather than stress yourself out about the things that you dont follow this advice and youll be amazed at how much of your anger problem begins to quickly disappear! * How to cure your anger problem in six easy steps follow these tips and youll put yourself on the fast track to feeling happy and content! * How to keep your emotions from playing tricks on your mind many times people get angry for reasons created by their feelings find out how to put an end to that in a hurry here! * How to refocus the energy from your anger problem into something more beneficial such as volunteering this way, your energy will be spent in a productive manner rather than a negative one! * How substance abuse can affect your anger problem plus, 11 substances that anyone with an anger problem should stay away from at all costs! * How anger can strip you of your quality of life ever heard of being scared straight reading these examples of anger gone too far could do just that to you! * Why when it comes to anger, laughter is the best medicine plus, five things you can do to get yourself laughing immediately! * 11 tricks for dealing with your anger learn to use these and youll be able to make yourself feel calmer and happier in no time! * How to teach yourself and your children to cope with anger including three amazing techniques anyone can use to finally gain control of their feelings and emotions! Right now, for a limited time, you can take advantage of a special promotional offer and receive the Anger Management: How to Stop Anger from Ruining Your Life ebook for just $1.90!